The planet that rules our reasoning and intellect is Mercury. This point in our birth chart tells us about how we speak, think and communicate with others in general. Ready to know more about Mercury in Libra? Air is the element of Libra (just as Gemini and Aquarius) and Venus is its ruling planet. In Astrology, we say this positioning is very positive because Libra has a good sense of justice and applies it in everything they say. 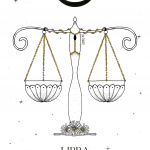 The symbol of Libra is the scales which means balance. Its diplomatic nature allows the coexistence with others to be very peaceful and fluid. For Mercury in Libra, one argument is not valid if it upsets theirs and the others’ sanity around. The eternal pursuit of harmony will make them the kind of person who is a monk in the midst of some commotion. It will be very difficult to see these people losing their temper and giving in to a fight. Everyone will be arguing and they will be the ones carrying the white flag of peace. They can do this because they do not feel a great need to stand and defend some point of view. They are not fixedly drawn by some other person’s purpose, and so they roam for many. As much as they are fair and sensible at the time of defending someone, they will always be able to see the other side of the story. Their speech is usually gentle and delicate. Venus is the planet of beauty and this will give them a gorgeous and elegant aura. Before transforming their thoughts into speech, they will think hard to make sure it is worth talking about. They are very sociable beings, who like to share ideas and hate being alone. But it is not every company that pleases Mercury in Libra. They do not like very loud places and people who speak loudly and aggressively. Their verbal ability is well developed and their visual capacity as well. They have a creative instinct that allows them to turn words into images. The artistic side usually appears when they are children and remains throughout life, creating pieces that communicate and touch their viewers. Sensitivity is another facet of this Mercury and they will be able to understand between the lines what a person feels or if they are lying. In fact, it is not uncommon to take advantage of these features to discover other people’s secrets. Skill with words and engaging people can be very beneficial. But as they use their own relationships to develop and strengthen others, they can let out a secret, a little gossip here or there. Maybe they do it sort of unconsciously, since their brain thinks of everyone as a whole. Life in society is very important to Mercury in Libra and although they get along well with everyone, they will prefer to be closer to those who have a refined or luxurious air. We must not forget that Venus is also a symbol of lust. In general, they transmit joy in the way they communicate and have everything to be nice and kind people. They just have to be careful to not lose their personality by trying to please everyone. What it also deserves attention is the frivolity and the fact of letting be enchanted by superficial things too much.